1950's-1960's 102nd Medical Battalion Pocket Patch. Fully machine embroidered. Unused. 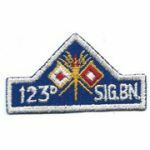 1950's-1960's 123rd Signal Battalion Pocket Patch. Machine embroidered on twill. Unused. 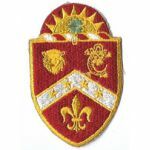 1950's- 1960's 14th Armored Cavalry Regiment Pocket Patch. German machine embroidered. Unused. 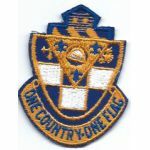 1950's-1960's 178th Infantry Regiment ocket Patch. Machine embroidered on twill. Unused. 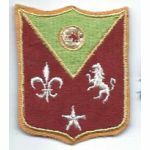 1950's-1960's 1st Battalion 10th Infantry Regiment Pocket Patch. Machine embroidered on twill. Used. 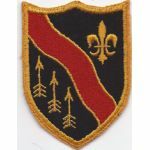 1950's-1960's 3rd Field Artillery Regiment Pocket Patch. Fully machine embroidered. Unused. 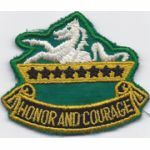 1950's-1960's 45th Armored Recon Pocket Patch. Fully machine embroidered. Unused. 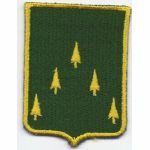 1950's- 1960's 48th Anit-Aircraft Artillery Battalion Pocket Patch. Fully machine embroidered. Unused. 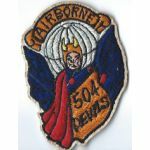 1960's Theatre Made 504th Airborne Infantry Pocket Patch. Asian machine embroidered ( early Taiwanese? ), has Chinese looking newspaper on reverse. Unused. 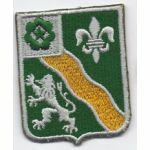 1950's-1960's 5th Infantry Regiment Pocket Patch. Fully machine embroidered. Unused. 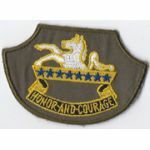 1950's- 1960's 63rd Armored Cavalry Regiment Pocket Patch. German machine embroidered. Unused. 1950's-1960's 69th Infantry Regiment Pocket Patch. Machine embroidered on twill. Unused. 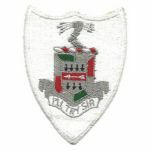 1950's-1960's 701st Ordnance Battalion Pocket Patch. Fully machine embroidered. Unused. 1950's- 1960's 70th Armored Cavalry Regiment Pocket Patch. German machine embroidered. Unused. 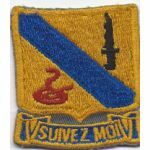 1950's-1960's 794th Ordnance Battalion Pocket Patch. Machine embroidered on twill. Unused. 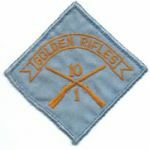 1950's- 1960's 81st Mortar Battalion Pocket Patch. German machine embroidered on twill. Unused. 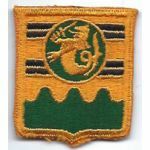 1950's-1960's 826th Tank Battalion Pocket Patch. Fully machine embroidered. Unused. 1950's- 1960's 8th Cavalry Regiment Pocket Patch. Machine embroidered on HBT. Unused. 1950's- 1960's 8th Cavalry Regiment Pocket Patch. German machine embroidered on twill. Used. 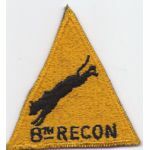 1950's- 1960's 8th Recon Pocket Patch. German machine embroidered. Unused.